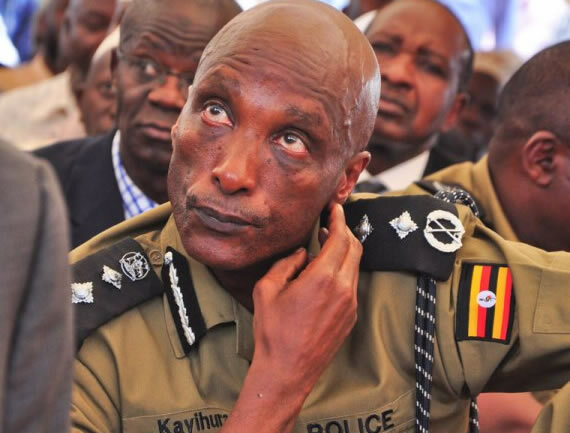 Three months after his sacking from being the inspector general of Uganda police, Gen kale kayihura is under arrest. The former police boss was arrested on 13th June 2018 from his home in kasagama Lyatonde by the Uganda people’s defense force (UPDF’s) chopper. A team of army officers led by Lt Gen Wilson Mbadi arrested the former boss. Much as Kayihura was arrested on 13th June, the rumors of his arrest was spread on 12th June when the first attempt was made by sending the chopper to pick him from court yard hotel in Lyantonde. On reaching the hotel, the army officers briefly introduced them selves to the hotel managers and hurriedly checked all hotel rooms, which left the hotel staff shocked. However, the first attempt was unfortunate since Kayihura was found to have traveled to Mbarara that he could not be traced hence the helicopter had to fly back. It was revealed that Kale Kayihura had been under house arrest without his knowledge. The blocking of the general two times from flying out of the country clearly indicate that the arrest of the general was not abrupt but had been planned earlier. The fallen general was arrested a day after all heads of Uganda Security agencies had a meeting with president Museveni, the commander in chief regarding security in the country. According to the army officials who arrested him, General kale kayihura is still soldier serving the Uganda people’s defense forces (UPDF). The serving officials therefore need him for some interrogations related to his works during his term of office. Gen Kale Kaiyihura has been living at his home in Lyantonde since his sacking despite several rumors about his where about. The question in most people’s mind is why was he arrested? The general was once a close friend to his Excellency the president of Uganda who at one time gave him a new name of a good cadre. In Uganda’s history, Kale Kayihura is a long serving inspector general who served for 13 years something no one else has ever done. Much as there is no detailed information as to why the General was arrested, its believed that the earlier arrest and confession of the former flying squad operative (Abel Kitagenda) caused much suspicions about Kayihura. In his confessions, Abel revealed that Kale Kayihura had a hand in the assassination of the former police spokes person the late Andrew Felix Kawesi who was killed near his gate. This created a need for Kayihura to report to Gen David Muhoozi the chief of the Defense forces for further investigations. While he was addressing the 23rd annual general meeting of local governments in September 2017, General Kale kayihura predicted his sacking and arrest from the criticism he had received from the president. The meeting was held at St Peters technical institute in mubende in which Kale Kayihura disclosed how Museveni the president was not happy with police services in preventing continuous crimes in the country. The general assured people that crimes in Uganda could never stop unless the government finds out root cause of the problems. Details of his where about are not known but we all believe that the general is safe in the hands of the police and Uganda army at large. Leaving-out kayihura stories, Uganda the pearl of Africa is a safe and distinct destination to stay in. the country is naturally gifted by beautiful landscapes, hospitable people and water bodies. Uganda offer travelers with memorable gorilla safari experiences in Bwindi impenetrable forest and Mgahinga gorilla national park.Other tourism activities in Uganda include chimpanzee tours in Kibale forest national park, bird watching, mountain climbing, cultural tours, nature walks, boat cruising and game viewing in the open savannah national parks in different parts of the country.